WordPress is a popular content management system (CMS) that helps you to control the contents without any technical background easily. However, this is a multi-functioned key to open all the doors for you. If you want people to find your contents easily, then deep research and knowledge about Search Engine Optimization (SEO) are necessary. Self-hosted WordPress blogs are probably the fastest way to get to the top of the natural search engine listings. There are thousands of WordPress plugins available, but here I will discuss only two that help with SEO and ultimately top search engine rankings. Are you telling me that you don’t know about SEO? Don’t worry because WordPress will offer you a solution. All you need to do is select the right SEO plugin WordPress. You will have many choices because there are a lot of SEO plugins exist in the WordPress plugins directory. To make it easy for you, this article will give you the showcase of two best WordPress SEO plugins which are perfectly designed to fulfill all SEO demands. There is no need to install a number of plugins. You just have to choose a single plugin from the two plugins that we are going to review. It will cater your all SEO needs. The two most essential WordPress plugins that help with SEO and search engine rankings are WordPress SEO by Yoast and All in One SEO Pack. Here we start discussing both plugins one by one. Let’s talk a look of WordPress SEO by Yoast first. This SEO plugin is by far the most popular WordPress SEO plugin. It includes a full range of SEO tools. It displays an SEO form below each page in your Admin view. This form clearly includes all the relevant tags you want to fill in for that page, including title, meta description, and others. The on-page form will also give an analysis report of that page’s SEO, including specifying changes that should be made to improve it. It will make suggestions ranging from issues like increasing the page’s word count to noting that your keyword isn’t used in any headings. The plugin also gives each page a clear color ranking of either green, yellow, or red to tell you that page’s SEO quality. When you’re looking at your full list of pages, you’ll the Yoast color for each page. This is great to get a quick visual which pages need more SEO work. This plugin includes other SEO tools like creating a sitemap, RSS optimization, and webmaster tools verification. Too many features for users. Allows edit robot.txt, .htaccess files. Easy to enable XML sitemap. Because WordPress SEO by Yoast is an excellent plugin, so I will give an introduction to setting it up. If you are using a plugin and is not happy with it, you can switch to its alternative. Or if your site has data related to the plugin, you can then do a proper migration by doing a data import. Yoast SEO comes with import and export tool, and it has options for importing from All -in-One SEO as well: Dashboard >> SEO >> Tools >> Import and Export >> Import from other SEO plugins. After the installation and activation of WordPress SEO by Yoast plugin, you will have an “SEO” icon on the left menu inside the Dashboard. In the General part, come to Webmaster Tools tab to add meta codes. In this section, you will choose your title separator that shows between your post titles and website name. People often use “|”. 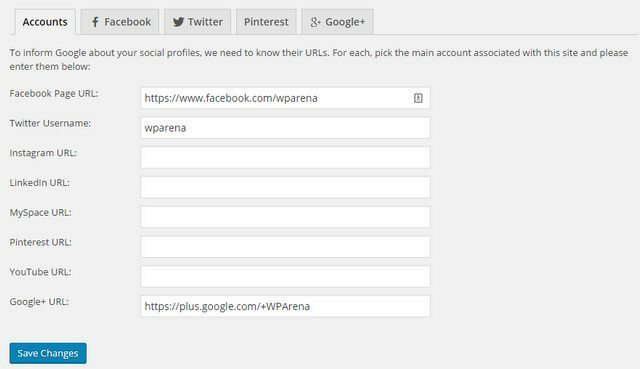 Just fill in your Social Profile URLs to get a proper linking of your social media accounts with your site. The sitemap is an important component because it is associated with the search engines and the published contents. Make sure to select the checkbox below and checkbox of User Sitemap tab. Both WordPress SEO by Yoast and All in one SEO plugins are very popular, widely used and highly rated by users. You can check features of each plugin individually and decide which one should be utilized. On WordPress Arena, we are using WordPress SEO by Yoast plugin because of its constant updates and improvements. And we are fully satisfied with it. The latest version of All in One SEO Pack plugin has options for adding your WordPress blogs home title, description, and keywords. The most advantageous option for SEO is the Rewrite Titles option. This option will display the more search engine friendly title of your post before the name of your blog in the title tag. Helping the keywords in your post title will get your post picked up first by the search engines. Fewer features to get your head around. Check out the tutorial in a video format! All In One SEO is a great plugin built for bloggers, magazines, online businesses and eCommerce sites. With all in one SEO pack, meta description and meta keywords will be automatically generated for you. Besides that, it will also help you to optimize title, add tags to replace the image in the post. By checking your site duplicate contents, this plugin can also help you to avoid your site from being penalized in Google. Especially, this is a great plugin for supporting eCommerce sites, including Woocommerce. The above two plugins and options, as well as good keyword rich titles and of course original content, will help you to top search engine rankings easily. Continued use of best recommended Google practices will get you in the top of the search engines in no time. Don’t believe me? Then, try any of the above SEO plugins and follow the guidelines of Google and Top Search Engine gurus. I like your work. This will really very helpful to select the specific one according to need.